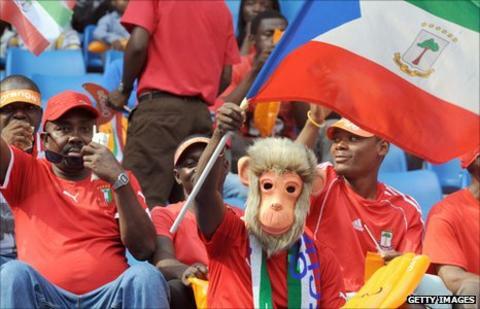 Fans have started arriving at the Estadio de Bata ahead of Saturday's opening match of the 2012 Africa Cup of Nations. The game sees co-hosts Equatorial Guinea take on Libya at 1830 GMT after the opening ceremony. Local fans have started to come out in force, waving flags, blowing vuvuzelas and banging drums. However, police used tear gas mid-afternoon to disperse fans trying to get into the stadium. With just one of the gates open to the stadium complex, officials were allowing in fans one-by-one until the build-up of bodies led to the possibility of a crush. But several times the crush proved too much and the gates were opened to allow scores of supporters through without being checked. On at least one occasion, tear gas was fired - but the situation has calmed down significantly since, aided by the opening of a second perimeter gate. Authorities had cut off all but authorised traffic from the kilometre of road leading up to the stadium. The opening ceremony is scheduled to get underway at 1715 GMT, following which Equatorial Guinea will make their Nations Cup debut. The squad has been offered a huge bonus by the son of president Obiang Nguema, with a million dollars on offer should the National Lightning beat surprise qualifiers Libya. But the stand-in captain of Equatorial Guinea, Juvenal Edjogo, has downplayed the importance of the cash offer. "We play for the love of our country and for football," he told BBC Sport. "If we win, he gives us money but the most important thing is to win as this will give us a possibility to progress out of the group stage." Meanwhile, Libya coach Marcos Paqueta believes his squad, who overcame the backdrop of civil war to qualify against the odds, are all set for the tournament. "My players are ready for the start - with determination and motivation," the Brazilian told BBC Sport. "My players don't have a lot of experience for a game like the Nations Cup, but I hope they can control their emotional pressure." Neither Equatorial Guinea nor fellow co-host Gabon have ever staged the Nations Cup before, and there is plenty of football fever across both countries. The Gabonese capital Libreville is awash with posters and placards promoting a tournament where the final will take place on 12 February. Is Libya set for bright future? Read more on Is Libya set for bright future?